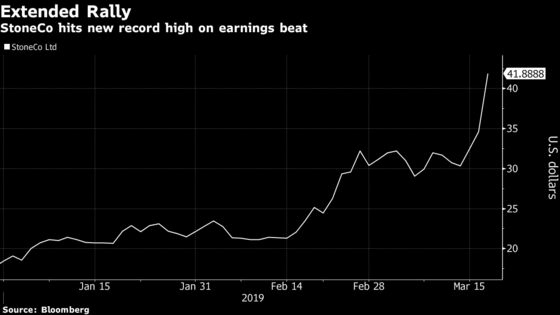 (Bloomberg) -- StoneCo Ltd rose as much as 27 percent to a record high after the financial technology company’s upbeat tone added to Wall Street’s excitement about strong fourth-quarter results. The Brazilian firm, which is backed by Warren Buffett, more than doubled its active clients during the quarter and said it is accelerating the rollout of new products and services. “More importantly, the company shared an encouraging qualitative message in the conference call, conveying that its plans have not been hindered by competition,” Credit Suisse analyst Lucas Lopes said in a note to clients. StoneCo’s competitor PagSeguro Digital Ltd gained as much 9.2 percent in New York.